Location: Athlone, County Westmeath, Ireland. Notes: Moydrum Castle is a ruined castle situated in the locality of Moydrum (Magh Droma in Irish), outside the town of Athlone, County Westmeath, Ireland. The lands of Moydrum were granted to the Handcock family, originally from Devonshire in England, during the Cromwellian plantations of Ireland in the 17th century. From then on the family remained one of the most prominent landowning dynasties and landlords in the area. Moving forward several generations, head of family William Handcock served as a Member of Parliament (MP) in Grattan's Parliament, representing Athlone until the parliament's dissolution in 1800 following the Act of Union with the United Kingdom. Handcock had originally been an opponent of the Act, but was promised a peerage should he vote in favour of it. He duly succumbed and finally, in 1812, Handcock was created 1st Baron Castlemaine. The Baron decided to create an appropriate stately home on his lands at Moydrum, and therefore asked architect Richard Morrison to remodel and enlarge an existing house belonging to the family there. The resulting gothic-revivalist castle was completed in 1814 and was described as a "handsome residence" in Samuel Lewis' 1837 Topographical Dictionary Of Ireland, "a solid castellated mansion with square turrets at each angle, beautifully situated by a small lake, and surrounded by an extensive and richly wooded demesne". By the 1880s, and the time of the 4th Baron, the Barony of Moydrum comprised 11,444 acres (46.3 km2). Growing tensions in Ireland ultimately led to the Irish War of Independence of 1919 - 1921. The effects of the war were felt in the Irish midlands as much as anywhere else in the country. In early July 1921 British military forces burned several homes in south Westmeath and, incensed, local Irish Republican Army (IRA) forces felt that this could not go unpunished. Moydrum Castle, given its status as the seat of a prominent member of the British House of Lords, was chosen as a suitably symbolic subject for their reprisals. On the night of July 3, 1921, an assembly of IRA members marched on the castle. The 5th Baron was out of Ireland at the time but his wife and daughter, together with several servants, were in residence and were woken from their sleep by knocking at the door. The Baroness and her daughter were given time to gather together a few valuable belongings before the building was set alight. The blaze completely destroyed the castle. Following the establishment of the Irish Free State, much of the land belonging to the Barony was improved, divided and sold on by the Irish Land Commission. The Baron, his wife and family were never to return to Moydrum. Photographer Anton Corbijn photographed Moydrum Castle for the cover of the Irish rock band U2's fourth studio album, 1984's The Unforgettable Fire and gave it a sepia tone. 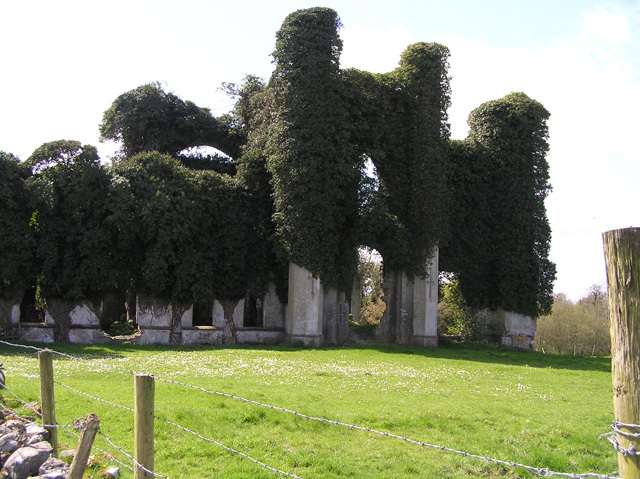 The photograph, however, was a virtual copy of a picture on the cover of a 1980 book In Ruins: The Once Great Houses of Ireland by Simon Marsden, for which U2 had to pay compensation. It was taken from the same spot and used the same polarising filter technique, but with the addition of the four band members.